The type of phase portrait of a homogeneous linear autonomous system -- a companion system for example -- depends on the matrix coefficients via the eigenvalues or equivalently via the trace and determinant. the demo of phase plane and phase trajetories are very interesting and easy to understand for the system of differential equation. Thank for your demo program. Why can't the top rows in the companion matrix be altered? Totally worthless. The Companion matrix is defined to have top row [0 1]. Thank you very much for sharing this app. It helps a lot in the qualitative understanding of the solutions. Thank you for this app. It was very useful to see the behavior of a system from a change in its matrix. 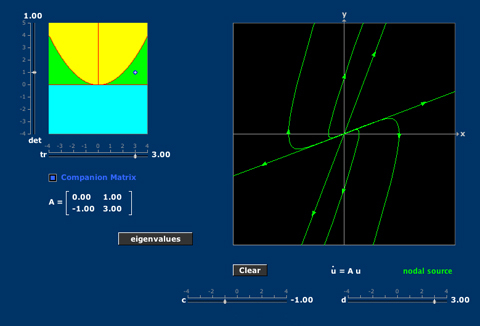 If you creates an app to plot nonlinear systems, please tell me. Have you looked at Vector Fields? Thank you Hanson for pointing this out. I think it has been fixed. This is the meaning of "companion matrix." You can adjust the top row by deselecting [companion matrix]. How did it go, Diego? Shouldn't the diagrams be different if t^2 - 4delta = 0 depending on in the matrix is diagonalisable or not? Yes ... and they are! Perhaps you have [companion matrix] checked: companion matrices with repeated eigenvalues are never diagonalizable. I can now understand how this works! really interisting and I now see things way more clear! Great, Joan. What was the AHA moment?